He is good in academics as well as curricular activities. His teachers are full of praises for him. 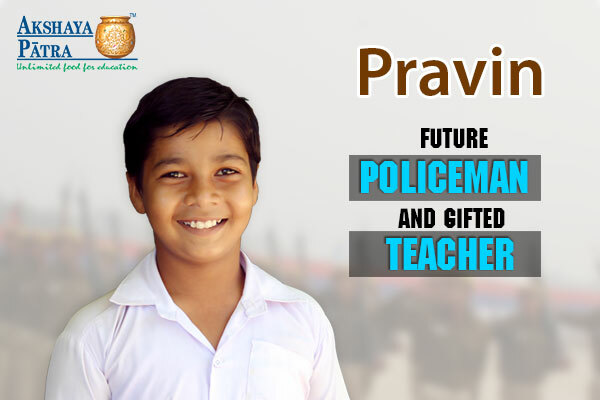 Interestingly, while Pravin has told us that he aspires to become a police officer, one of his teachers’ extoled him for his performance as a teacher on Teachers’ Day. He told us excitedly that for his outstanding performance, he won a compass box. Pravin’s father is a farmer and his mother, a homemaker. They are five siblings; all of them study in the same school. He told us that he likes Akshaya Patra food—dal-roti and rice being his favourite—because it is tasty and nutritious. He spoke like an expert, telling us how good food results in good thoughts, which in turn, help them in their studies. He also said that one of the main reasons he and his siblings like coming to school is that they get warm nutritious meals from time-to-time. Other than that, he gets to play his favourite sport, kho-kho. He also told us that school is where they get life lessons and school is akin to a knowledge temple. We wish Pravin the very best for his future!